March 2018 Security Releases Now Available — 9.10.0 (Current), 8.11.0 (LTS), 6.14.0 (LTS) and 4.9.0 (Maintenance) are out with updated OpenSSL and security fixes for a DoS vulnerability and an HTTP parsing flaw. Note that this is now almost certainly the final 4.x release, too, so work on your upgrade plans now if you’re still on it. Task Easy: A Simple Priority Queue for Promises — Ideal for running asynchronous tasks in a defined, synchronous order. Full-Stack Monitoring for Node Apps — Utilize distributed tracing and interactive flame graphs to track performance and optimize Node applications. Monitor and alert on infrastructure metrics, request traces, and logs in real-time. Try Datadog free. npm v5.9.0-next Released — The latest cutting edge version of npm is out with npm view now giving a neater, more human-friendly summary of a package by default (see below). A Slack App Step-by-Step: A Real-Life Example — A thorough walkthrough of what building a Slack app with Node and Express.js entails. Announcing a Node.js 'Snap' for Linux Users — Snaps are containerized Linux packages and now Node and npm are easy to install (and switch) using them. Node Expert? Sign Up for Vettery — Create your profile and we’ll connect you with top companies looking for talented back-end developers. Sympact: A Simple CPU and Memory Tracker for Node Apps — Profiles execution time, CPU usage, and memory usage, then returns an overall report. better-xlsx: A Library for Working with Excel Spreadsheets — Open or create Excel XLSX files and work on sheets, rows, cells, etc. Host Validation: Express.js Middleware to Validate 'Host' and 'Referer' Headers — To protect against DNS rebinding attacks. WildDuck: A Robust IMAP/POP3 Mail Server — Uses MongoDB for storage, and Redis for counters and pub/sub. 20 Node Modules You Need to Know — It’s listicle time. A Checklist of Node Production Best Practices — 19 tips and best practices to consider when heading to production. 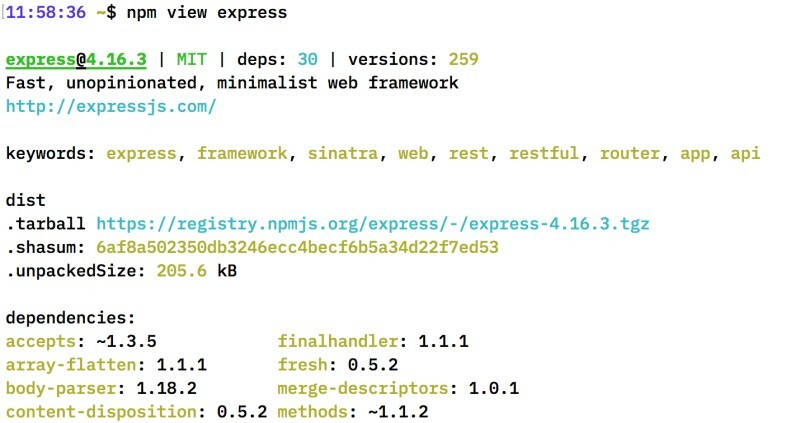 npx: An npm Package Runner That Comes with npm — npm 5.2 introduced npx, and if you’ve not used it yet, this intro is worthwhile.